Easy and fast, you can use Google’s tool to instantly see if your website is mobile-friendly! According to a recent Alexa survey nearly 88 percent of SEO experts rank “mobile-friendly” as a 5 (based on a 1–5 scale), making it the most important SEO consideration. More and more each day, Google continues to put emphasis on the fact that your website must be designed for an optimal experience on mobile. Add to the fact that mobile devices continue to gain ground, and in many instances have already overtaken desktop computers, as the primary device used for searching on Google, and it is quite obvious that attention needs to be given to a mobile website design. If you don’t focus on mobile, you’re not going to be getting any new customers from your website in the near future. 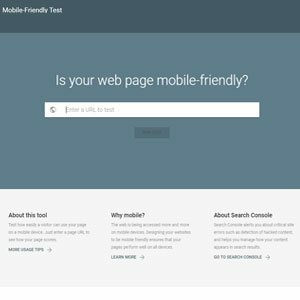 Use the Google Mobile-Friendly Test and see if your site is mobile-friendly, or not! You’ll quickly get a pass or fail grade, with a list of accompanying issues if you happen to fail the test. IF your website fails, no worries. We can help!